The May long weekend was pretty much a wash-out this year. Literally. In the last month, I think we have had two days without rain. Luckily yesterday was one of them so we took advantage and headed to the beach. It was too cold for us to go swimming, but that didn’t stop Shiva. Technically dogs aren’t supposed to be off-leash in this area but since the temperatures were so low, nobody seemed to mind Shiva enjoying herself. It’s fantastic we can bring her places like this now without worrying she will bug others. We can trust she will just do her own thing and stay relatively close to us. It’s opened up a whole new world for the entire family. I remember when I finally had that feeling with Barbie! It is so liberating and I am so proud of her when she proves herself worthy of our trust again and again! Beach time is the best! and it’s so much more fun when you can let your dog run! Ugh, I’m sorry you’ve also had the rain. It seems we’re not allowed more than fifteen minutes of sunshine at once. *sigh* I just hope the entire summer isn’t like this. AAAhhh the joys of a dog that can reliably be off leash. 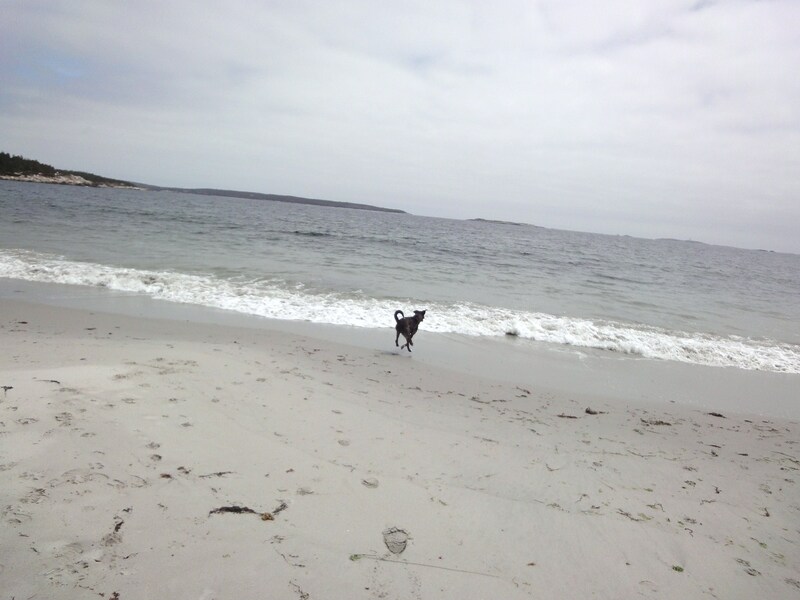 I envy you having beaches nearby, I have a feeling luna would love that, not to mention Wyatt too. We have had a lot of rain here, it is even currently raining. Which leaves our waterways very high so no real swimming yet. Nowhere else for the water to go though but into the waterways, ground has had it’s fill and then some. Hopefully nice weather will return to you soon. Did you move from WordPress? I was wondering why you have not been showing up in my Sub feed anymore. It is still far far far too cold for any human swimming. In Nova Scotia the ocean is pretty much always cold. There is a very brief period in August where the beaches are packed but otherwise one needs a wetsuit to enter that frigid water. At least the dogs can enjoy it! Yes, I did move from wordpress.com to wordpress.org and apparently it messed around with my subscriptions. I should have anticipated that but I thought since my domain wasn’t changing it wouldn’t be a problem. I’m so sorry that you’ve been having trouble! I am so glad you have reached that place, I am fairly confident we will be reaching it very soon! Yay! Thanks! It takes time but like everything else with dogs, it is worth the effort! She looks like she’s having so much fun! Oh the places you’ll go….. Both of you had a good time at the beach! It seems lousy weather has its advantages too. Water Puppy 😀 The long weekend in Ontario was pretty hit or miss. It rained ALL DAY on Monday. Boo..
brr brr brr that just looks chilly! Looks like the perfect day! 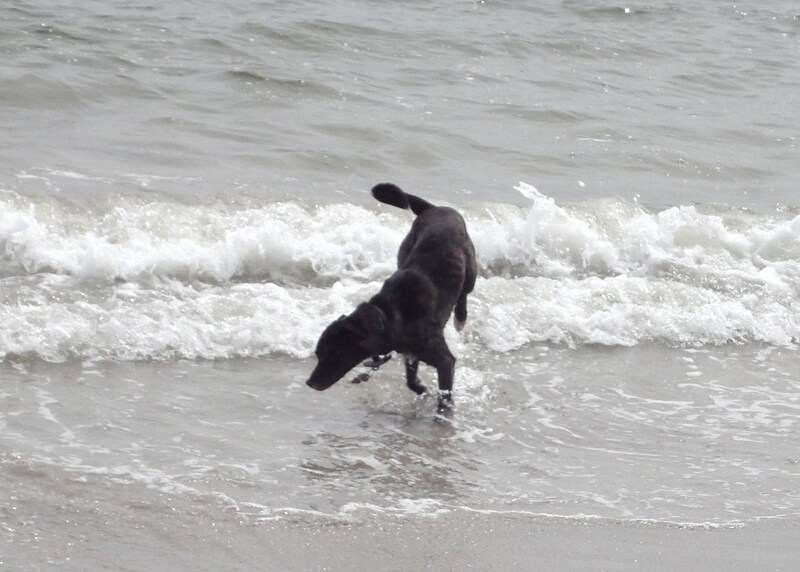 I love watching dogs play on the beach, they have so much energy, enthusiasm and great spirits! We’re finally getting warmer weather, but we’re not beaching it! And even though it’s warmer, it’s still mixed with rain, and mud, and humidity! Oh, that view looks heavenly! I love rocky beaches (I’ve been to a few in Maine). One day, I hope to get my boys to a beach somewhere. Off leash dog frolicking is liberating for sure! I love that photo of Shiva looking upward. I’m so glad to see her enjoying herself, and it’s even better that you’re enjoying the outings with her too. Very cool! That second to last shot of Shiva is absolutely stunningly gorgeous. That’s one beautiful dog you have there. Getting to enjoy special times together is the best reward for all those months of hard work and mortification at Shiva’s behavior. Great pictures. I showed them to Honey. I hope she’s inspired to spend more time in the water this year. Luckily, the lake warms up faster than the ocean. Sigh…South Texas would have loved to have some of your rain! I didn’t realize you moved to .org. I wondered why I didn’t see you in my WP subs!